MASTERON (Drostanolone Propionate) is an European injectable preparation containing the steroid drostanolone propionate. Drostanolone is a derivative of dihydrotestosterone, most specifically 2alpha-methyldihydrotestosterone. As a result, the structure of this steroid is that of a moderate anabolic/potent androgen which does not aromatize to estrogen. Water retention and gynecomastia are therefore not a concern with this compound. MASTERON (Drostanolone Propionate) may exhibit antiestrogenic activity in the body, competing with other substrates for binding to aromatase. 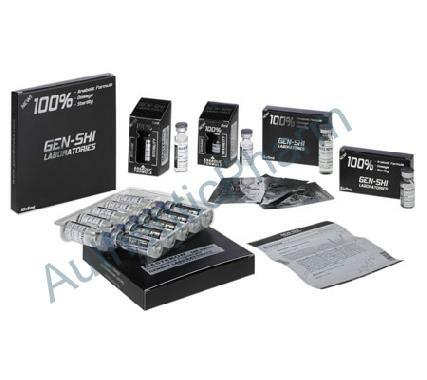 This would reduce the conversion rate of other steroids, MASTERON (Drostanolone Propionate) is most often used by bodybuilders who are preparing for a show due to the fact that the androgenic nature of it will give a hard, defined look to the muscles. Users of MASTERON often report increases in strength and muscular stamina. It is also used by athletes in speed related and weight regulated sports, where it is a favorite due to its ability to produce good gains in lean muscle mass and strength with some reduction in body fat and minimal side effects. MASTERON is most often used in cutting cycles where it is stacked with other hardening, non aromatizing agents such as trenbolone and winstrol. These types of cycles will produce usually no water weight and the mass gained off of them will be quality rock hard muscle mass. MASTERON (Drostanolone Propionate) can be androgenic and the usual androgen related side effects are possible from using this substance. Androgenic side effects can include things such as oil skin, acne, and increased body and facial hair. Like other anabolic/androgenic steroids when taken in dosages that can promote muscle growth, MASTERON can suppress the body?�?�?�????????? ?s natural testosterone function and production. Because of this, a proper post cycle therapy protocol should be followed upon the discontinuance of a cycle. Most users typically choose to run agents such as clomid and HCG to effectively get their body to start producing testosterone from the testes and pituitary gland again. Men often take MASTERON (Drostanolone Propionate) in dosages of 300 - 600mg per week for 6 - 12 weeks depending on how they respond and what the goals are. The propionate ester used with this compound will extend its activity for only a few days, therefore MASTERON should be injected ever other day to keep blood levels as stable as possible. Women who choose to run MASTERON often do so in a dosage of 50-100mg per week.